We have wide range of villas for rent on Korcula island, from top luxury villas with pool on the seafront Korcula, to stone cottages for rent on Korcula. Korcula is one of the most beautiful islands of Croatia. Crystal clear and clean sea water is healthy for swimming. Sea shore is mostly rocky but there are fine pebble beaches everywhere, most of them are accessible with car and usually there will be no crowd or no one on the beach but you. Korcula island is not so small but also not too large. Driving from Korcula town on the south east side of the island to the other side, far north west where is Vela Luka town, will take 50 minutes. Korcula town is amazing, it is not possible to describe the beauty of this town which historical heritage dates from Old Greek times. We believe that Odyssey was here, in his time this island was named Korkyra. 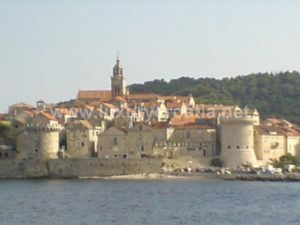 Korcula old town is walled with fortresses. Inside there are narrow stone streets, churches, old stone houses with authentic look for centuries, preserved completely. In summer time there are a lot restaurants serving local food and local wine. Town of Vela Luka is on the other side of the island. It also has old town laid along the wide bay which was place to moor ships, and today it is ferry port for ferries and catamarans going from Split to Vela Luka and to Dubrovnik. There are a lot small coastal villages with stone houses nested in the pine woods on the hillsides, with beautiful beaches. The most beautiful villas for rent we have on this island of Korcula. We have several seafront villas with pool for rent Korcula Prizba. 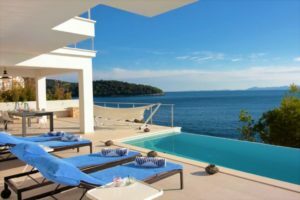 Also in our offer is luxury beach front villa with pool Korcula Karbuni area, with large 100 square meters pool and panoramic sea view. Vela Luka is 10 minutes drive. Korcula villas for rent are located in green surrounding and quiet places with sea view or directly on the waterfront with pool.